We continue to meet at 10 am on the 2nd Tuesday each month in the Wesley Room at Beeston Methodist Church, for friendly and informal discussions about our chosen book for that month. We are fortunate in the support of Beeston Library in getting multiple copies of books for the Book Group, although some members like to buy their own copies. Suggestions come from the group initially to work up our reading list…..in September we read Conclave by Robert Harris, a thriller with a difference about some darkish doings surrounding a (fictitious) papal election, which was a surprisingly gripping read and most members enjoyed. We are not neglecting the classics either – Henry James’ The Bostonians was our book for August but we were unanimous that this was not his finest effort and we wouldn’t be hurrying to read more! In October we were fortunate in having Nottingham author Eve Makis join us, and she gave us an excellent insight into how she came to write her 2015 novel, The Spice Box Letters, which was our chosen book for the month. Eve wanted to explore one of the minority communities in Cyprus, and on discovering how the Armenians came to be living there following the 1915 Armenian genocide and subsequent expulsion from Eastern Turkey, this became the inspiration for her novel about the experiences of an Armenian family. Eve is returning in November to share her latest publication with us, which is hot from the press, so we’re looking forward to that! We’ll also be discussing politician Alan Johnson’s memoir ‘This Boy’, the first book of his trilogy which all have titles taken from Beatles songs…. Our final read of 2017 will be Tracy Chevalier’s At the Edge of the Orchard. We were the first U3A book group to be set up; we’re still up to capacity and have been unable to include any new members for some time. We’re still much larger than most other book clubs, so we don’t run a waiting list. However, several other new U3A general book groups have been set up to meet the demand. Please see the groups listings for the contacts of the other book groups. We now have 5 book groups. We continue to meet at 10 am on the 2nd Tuesday each month in the Wesley Room at Beeston Methodist Church, for friendly and informal discussions about our chosen book for that month, which hopefully everyone will have managed to read! We are fortunate in the support of Notts Library Service (normally Beeston Library, but we are using Stapleford during the refurbishment) in getting multiple copies of books for the Book Group, although some members like to buy their own copies. Suggestions come from the group initially to work up our reading list. In April we read The Garden of Evening Mists by The Malaysian novelist Tan Twan Eng, which was longlisted for the Booker and won the 2012 Man Asian prize – a few members have already enjoyed this book and it was generally well received by the group, producing quite a lot of discussion. May‘s Book is Louis de Bernieres’ 2015 novel, The Dust That Falls From Dreams set around WW1, and in June we are discussing The Road Home by Rose Tremain with its theme of migrant workers from Eastern Europe arriving in Britain. We are not neglecting the classics either – Henry James’ The Bostonians is one of our planned reads for later in the summer. We are still up to capacity and have been unable to include any new members over a year – even so, we are still much larger than most other book clubs – so unfortunately, I am unable to add names to our waiting list. 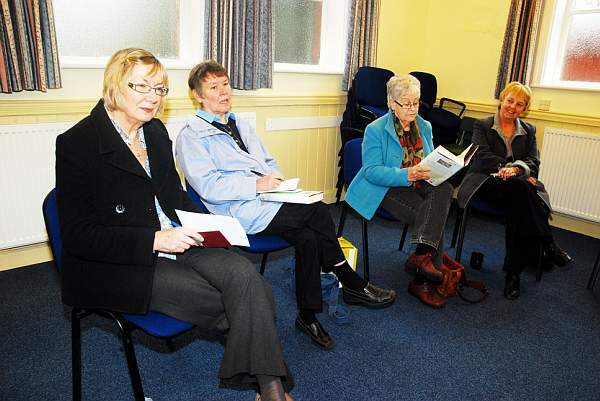 However, other new U3A general book groups have been set up to meet the demand. Please email me at ejslarch@outlook.com if you would like to be included on the waiting list for the next new book group to be set up. Suggestions come from the group initially to work up our reading list…..we have read two non-fiction books recently – The Secret Rooms by Catherine Bailey in December about the Dukes of Rutland and so-called ‘mysteries’ at Belvoir Castle in the early 20th century, followed by the 2015 best-selling memoir, The Shepherd’s Life by James Rebanks concerning his life as a Lakeland shepherd, which was our read for January. Opinions in the group were quite varied about both books, which is what we like! We will be returning to contemporary fiction once more in February, when we discuss Maggie O’Farrell’s Instructions for a Heatwave and in March we plan to read Leaving Time, by Jodie Picault. In April, we have reserved The Garden of Evening Mists by The Malaysian novelist Tan Twan Eng, which was longlisted for the Booker and won the 2012 Man Asian prize – a few members have already enjoyed this book. We are still up to capacity and have been unable to include any new members for more than a year – even so, we are still much larger than most other book clubs – so unfortunately, I am unable to add more names to our waiting list. However, the good news is that over the last six months, two other new U3A general book groups have been set up to meet the demand. Please email me at ejslarch@outlook.com if you would like to be included on the waiting list for the next new book group to be set up. We continue to meet on the 2nd Tuesday each month in the BMC Wesley Room at 10 am, for friendly and informal discussions about our chosen book for the month, which hopefully everyone will have managed to read! We are fortunate in the support of Beeston Library in ordering books for the Book Group, although some members like to buy their own copies. Over the summer months, we have read and discussed ‘The Tenant of Wildfell Hall’ by Anne Bronte, ‘Us’ by David Nicholls, ‘The Children Act’ by Ian McEwan and ‘The Spool of Blue Thread’ by Anne Taylor. We broke with tradition and met in August, when we welcomed North Notts writer Anne Goodwin, to discuss her debut novel ‘Sugar and Snails’, published in 2015, and currently on the shortlist for the Polari First Book prize. In September, we will be discussing ‘The Good Girl’ by Fiona Neill and plan to read ‘The House of Orphans’ by Helen Dunmore in October. We are larger than many book clubs – and we are still up to full capacity. Despite the second U3A general book group called ‘Readers’ Rendezvous’, now being up and running, this hasn’t had any effect on reducing our waiting list, so unfortunately, we can’t add any more names for the time being, but ‘Readers’ Rendezvous. is still able take a few members. We continue to meet on the 2nd Tuesday each month in the CRMC Wesley Room at 10 am, for friendly and informal discussions about our chosen book for the month, which hopefully everyone will have managed to read! We are fortunate in the support of Beeston Library in ordering books for the Book Group, although some members like to buy their own copies. Over the summer months, we have read and discussed ‘The Tenant of Wildfell Hall’ by Anne Bronte, ‘Us’ by David Nicholls, ‘The Children Act’ by Ian McEwan and ‘The Spool of Blue Thread’ by Anne Taylor. We broke with tradition and met in August, when we welcomed North Notts writer Anne Goodwin, to discuss her debut novel ‘Sugar and Snails’, published in 2015, and currently on the shortlist for the Polari First Book prize. In September we will be discussing ‘The Good Girl’ by Fiona Neill and plan to read ‘The House of Orphans’ by Helen Dunmore in October. We are larger than many book clubs – and we are still up to full capacity. Despite the second U3A general book group called ‘Readers’ Rendezvous’, now being up and running, this hasn’t had any effect on reducing our waiting list, so unfortunately, we can’t add any more names for the time being, but Readers’ Rendezvous is still able take a few members. We continue to meet on the 2nd Tuesday each month in the CRMC Wesley Room at 10 am, for friendly and informal discussions about our chosen book for that month, which hopefully everyone will have managed to read! We are fortunate in the support of Beeston Library in ordering books for the Book Group, although some members like to buy their own copies. The Unlikely Pilgrimage of Harold Fry by Rachel Joyce and by way of a contrast we’ll be considering one of the classics in April – The Tenant of Wildfell Hall by Anne Bronte. We are still operating a waiting list as we are up to capacity – and we are larger than many book clubs. However, we have been able to welcome some new members over the last few months, as a few places became available, and the waiting list is reviewed on a regular basis. There is also the possibility of another book group being set up. Please telephone me on 9226643 or email ejslarch@outlook.com if you would like to go on the waiting list. We have read a variety of books over the last few months – in September we discussed Deborah Moggagh’s novel In the Dark and in October by way of contrast, we included some non-fiction with Unbroken, Laura Hillenbrand’s biography of World War II hero Louis Zamperini, a former Olympic track star who survived a plane crash in the Pacific, spent 47 days drifting on a raft, and then spent more than two and a half years as a prisoner of war in three brutal Japanese prisoner-of-war camps. That was followed by Sycamore Row, one of John Grisham’s courtroom novels, a sequel to his first novel ‘A Time to Kill’ written 25 years previously. In December we have chosen The One Hundred Year Old Man Who Jumped Out of the Window and Disappeared, a snappy title for a quirky book by Danish author Jonas Jonasson. In the New Year, we have planned to read a couple of books recently made in to films – the Miniaturist by Jessie Burton, set in 17th century Amsterdam, followed by Colm Tiobin’s Brooklyn in February. We are still operating a waiting list as we are up to our maximum number – and we are larger than many book clubs. However, we were able to welcome some new members in September, as a few places became available, and the waiting list is reviewed on a regular basis. Please telephone me on 9226643 or email ejslarch@outlook.com if you would like to go on the waiting list. We read Judith Allnatt’s A Mile of River in April, which was enjoyed by all and at our May meeting we discussed The Fishing Fleet – Husband Hunting in the Raj by Anne de Courcey, of which we were unanimous in our view that although it contained a wealth of potentially interesting information, it was not a well-constructed book and needed a good editor! In June we will be discussing Sally Magnusson’s memoir of her mother who suffered from Alzheimer’s – Where Memories Go. We then have The Rosie Project by Graeme Simsion for July, which should be a bit more of a light-hearted summer read. We have a break in August and start again in September, and we have started planning for the next few months, including maybe inviting some local authors to talk to us. We are still operating a waiting list as we are up to optimum numbers, but we have been able to offer places to potential new members as they become available. Please telephone me on 9226643 or email ejslarch@outlook.com if you would like to go on the waiting list. We read Geoffrey Deaver’s The Bone Collector for our January discussion and in February we rang the changes with some non-fiction – Black Diamonds by Catherine Bailey, about the demise of an aristocratic Yorkshire coal dynasty in the first half of the twentieth century. In March we will be reading Alison Moor’s The Lighthouse, followed by Judith Allnatt’s A Mile of River. We have some more books planned for the next few months, depending on availability from the library. We read An Officer and a Spy by Robert Harris in September, And the Mountains Echoed, the latest book by Khaled Hosseini, author of The Kite Runner, in October. We have been reading A Week in December by Sebastian Faulks to discuss at the November meeting, and will be looking at Life After Life by Kate Atkinson in December. We have further books earmarked for 2015 including Geoffrey Deaver’s The Bone Collector for our January read. We continue to meet on the 2nd Tuesday each month in the CRMC Wesley Room at 10 a.m., for friendly and informal discussions about our chosen book for that month, which hopefully everyone will have managed to read! We are fortunate in the support of Beeston Library in ordering books for the Book group, although some members like to buy their own copies. We read A Perfectly Good Man by Patrick Gale in June and Blue Eyed Boy by Joanne Harris in July, for which there was a unanimous ‘thumbs down’ – unusual for us as we normally have a range of divergent views. We have a break in August when we don’t meet, but some of us will be visiting Bromley House Library in the City centre instead, which is one of the few remaining subscription libraries in the UK and has been operating continuously since 1816 in a Grade II* listed town house on Angel Row, and it also has a walled garden. Books planned for our autumn reads are An Officer and a Spy by Robert Harris plus And the Mountains Echoed, the new book by Khaled Hosseini, author of The Kite Runner. We are still operating a waiting list as we are now up to optimum numbers. Please telephone me on 9226643 or emailejslarch@outlook.com if you would like to go on the waiting list. In March we read The Tenderness of Wolves by Stef Penney which went down well with many of the group and In April discussed The Wide Sargasso Sea by Jean Rhys, a Jane Eyre ‘prequel’ which was less popular. May’s book was Tracy Chevalier’s The Last Runaway. Books we have in the pipeline are A Perfectly Good Man by Patrick Gale, Blue Eyed Boy by Joanne Harris and Black Diamonds by Catherine Bailey. We have been able to include some new members recently, as a few of our existing members have moved on, however we are now up to optimum numbers so have decided to operate a waiting list once again. Please telephone me on 9226643 or email ejslarch@outlook.com if you would like to go on the waiting list. We continue to meet on the 2nd Tuesday each month in the CRMC Wesley Room at 10 am, for friendly and informal discussions about our chosen book for that month, which hopefully everyone will have managed to read! We are fortunate in the support of Beeston Library in ordering books for the Bookgroup, although some members like to buy their own copies. We discussed The Curious Incident of the Dog in the Night-Time by Mark Haddon in December, and January’s read was The Poet’s Wife by Judith Allnatt about the poet John Clare, both of which most people seemed to enjoy. In February our chosen book was The Year of the Flood, by Margaret Atwood, which had more of a mixed reaction in the group. In March we will be reading The Tenderness of Wolves by Stef Penney and In April plan to look at The Wide Sargasso Sea by Jean Rhys. We have been considering some more ideas for a varied selection of books for later in 2014 and will be seeing what Beeston Library has available for us to order. We have been able to include new members recently, as a few of our existing members have moved on, so we aren’t running a waiting list at the moment. Please telephone me on 9226643 or email ejslarch@aol.com if you would like to join us. We continue to meet on the 2nd Tuesday each month in the CRMC Wesley Room at 10 am. We discussed Wolf Hall by Hilary Mantell in September, a mighty tome about Thomas Cromwell, which needed the summer break for us to get through. After we had read Sovereign by C J Sansom in October, a sort of Tudor ‘who-done-it’, we felt we had had enough of Henry VIII for a while, so in November we chose a more light-hearted read with Bill Bryson’s Life and Times of the Thunderbolt Kid, a change from our planned book. We are currently reading The Curious Incident of the Dog in the Night-Time by Mark Haddon, to discuss in December, and January’s read is The Poet’s Wife by Judith Allnatt – the poet in question in the novel is John Clare. We have some books planned for the early months of 2014 and will be deciding what else we fancy tackling as the months go by. We have been able to include new members from the waiting list recently as a few of our existing members have moved on, but we are still operating a waiting list for anyone else interested in joining. Please telephone me on 9226643 or email ejslarch@aol.com if you would like to be included on the waiting list. We continue to meet on the 2nd Tuesday each month in the CRMC Wesley Room at 10 am. We discussed Revolutionary Road by Richard Yates at the June meeting and Half of a Yellow Sun by Chimamanda Ngozi Adichie in July. We didn’t have a meeting in August and are due to discuss Wolf Hall by Hilary Mantell in September, a mighty tome which needed the summer break for us to get through! In July, some of us attended an event hosted Beeston Library, to meet first-time young author Joanna Rossiter to discuss her recently published novel The Sea Change, as part of a nationwide book club tour. It was very interesting to hear about the inspiration for her novel, the process both of writing and getting published and being selected for inclusion in the Richard and Judy Book Club. As ever, Beeston Library was very helpful in getting copies of the novel for us to read beforehand. We have another fat book to read for the October meeting – Sovereign by C J Sansom – as I discovered when I went to collect a dozen copies from the library on my bike this week and had to make two trips! In November we are discussing A Prayer for John Meanie by John Irving and December’s book is Cloud Atlas by David Mitchell. Over the next couple of months we’ll be discussing what we want to have on our reading list for 2014. The Book group is currently still closed to new members, and we are operating a waiting list for anyone interested in joining. We’ll review this over the next month or two if numbers remain high. Please telephone me on 9226643 or email ejslarch@aol.com if you would like to be included on the waiting list. We continue to meet on the 2nd Tuesday each month in the CRMC Wesley Room at 10 am. We discussed Sarah’s Key by Tatiana de Rosnay in March, Remarkable Creatures by Tracy Chevalier in April and Winter Ghosts by Kate Mosse in May. Planned reads for the next few months are Revolutionary Road by Richard Yates for discussion at the June meeting and Half of a Yellow Sun by Chimamanda Ngozi Adichie in July. Wolf Hall by Hilary Mantell should keep us busily reading until September, as there is no meeting in August. Attendance has remained high, so the Book group is still closed to new members for the time being, and we are operating a waiting list for anyone interested in joining. We’ll review this in due course if numbers stay at the same level. We continue to meet on the 2nd Tuesday each month in the CRMC Wesley Room at 10 am. We discussed Maeve Binchey’s ‘Minding Frankie’ in December, ‘Snowdrops’ by Andrew Miller in January and Jamragh’s Menagerie by Carol Birch in February, all of which generated a range of views and some quite lively discussion from book group members. Planned reads for discussion over the next few months are Sarah’s Key by Tatiana de Rosnay in March, Remarkable Creatures by Tracy Chevalier in April and Winter Ghosts by Kate Mosse in May. We have also decided which books to read up to the end of the year and these have been ordered from Beeston Library, which offers us a very good service. Attendance has remained high with over 20 members coming to each meeting since the autumn, and so that everyone can participate easily in discussions, we have decided to close the book group to new members for the time being, and will operate a waiting list for anyone interested in joining. We’ll review this in due course if numbers stay at the same level. We continue to meet on the 2nd Tuesday each month in the Wesley Room at 10 am. In September a number of new members joined us and we have averaged 19 or 20 at recent meetings. In recent months we have discussed Margaret Forster’s ‘Good Wives?,’ ‘The Reluctant Fundamentalist’ by Moshin Hamid. ‘Notes from an Exhibition’ by Patrick Gale. Future planned reads are Maeve Binchey’s ‘Minding Frankie’ for December, ‘Snowdrops’ by Andrew Miller for January and ‘Jamragh’s Menagerie’ by Carol Birch for February. We continue to meet on the 2nd Tuesday each month in the Wesley Room at 10am, with usually around a dozen of us turning up. June’s chosen book was ‘The Guernsey Literary and Potato Peel Pie Society’ by M A Shaffer and A Barrows, an intriguing title inspired by the occupation of Guernsey during the war, which generated some quite diverse views in the group. July’s read by Nancy Horan, ‘Loving Frank’, a novel about the architect Frank Lloyd Wight produced one of the liveliest discussions that we’ve had so far. After a break in August, at September’s meeting we’ll be getting everyone’s ideas for books to read later in the year and discussing Margaret Forster’s ‘Good Wives?’, which is a biographical comparison of the wives of three famous men of the19th and 20th centuries with the author’s contemporary marriage. For October, we have decided to read ‘The Reluctant Fundamentalist’ by Moshin Hamid. The book group continues to attract an average of 12 members per session, which works well for congenial discussion. In our last two meetings we have explored ideas about “Before I go to Sleep” by S.J. Watson and Dickens’ “Pickwick Papers”. In June the chosen book is “The Guernsey Literary and Potato Peel Society” by M.A. Shaffer and A. Barrows. For July we’re reading “Loving Frank”, a Biographical book about the American architect Frank Lloyd Wright. After that we’ll take a break until September. We seem to cover a range of genres and generate interesting discussion both on the books suggested by members and on life in general. We continue to meet on the 2nd Tuesday morning of each month in the Wesley Room and are getting to know each other better and engage in wider discussion. Recent books have been “Call the Midwife” and “The Constant Gardener”. In March we’ll be discussing “The Thread” by Victoria Hislop, followed in April by “Before I go to sleep” by S.J. Watson. We have already discussed books suggested by members from a range of reading genres. In November, having read “Narrow Marsh”, we were fortunate to have a visit from local writer Alan Dance who talked about his writing process. We shall be discussing “To Kill a Mocking Bird” on Tues. 13th December as well as “The Help” by Kathryn Stockett, also set in Mississippi and just being released as a film. Contact group leaders re festivities to follow 9.30 meeting.